In this post, I’m going to review two speakers from very popular brands: Boom 2 from Ultimate Ears and Pulse 3 from JBL. First, we will take a look at the design and how good are these speakers when it comes to water resistance. Then we will check the most important part of the speaker – the sound, whether the LED lighting in Pulse 3 has an effect on sound quality and how much sound can we get from the small form factor of Boom 2. Next, we will look at two very important aspects of Bluetooth speaker – connectivity and battery life. In the end, we will sum it up and list all pros and cons of these speakers. Boom 2 is very similar in design to its older brother – Boom. It’s portable and offers a sleek design, making it easy to carry around in a backpack. You can take it for a picnic or a beach. What has changed since the previous model is that this one has a tighter weave on the fabric cover, making it more sturdy. Additionally, the flap covering the ports is now better integrated into the unit. Pulse 3 is a bit bigger and less portable than Boom 2. At the bottom of the speaker there are three 40 mm drivers which play sound in all directions, and on the top, there is a passive radiator that improves bass response. The other bass radiator is on the bottom of the device. Remember to place Pulse 3 on the flat surface, otherwise, the bottom passive radiator will be blocked. JBL redesigned this model quite a bit, and now 60 percent of the speaker is covered in attractive 360-degree LED lights that offer a few of color and pattern variations. The light changes depending on music and colors keep cycling through your chosen palette. The speaker is equipped with a camera, which you can use to match the colors around you. You can switch the lights off by holding down the button on the speaker. This will increase the battery life. On the top of the speaker, you will find the power and the Bluetooth pairing buttons. Boom 2 offers hand gestures – tap the top of it to pause your music and double-tap to skip a track forward. You have to hold the speaker in your hand in order to use hand gestures. Behind the rubber flap, there is the 3,5 mm input and the micro USB input for charging. There are plus/minus volume buttons for Bluetooth pairing, speaker linking, and switching the various light patterns. The power button is accompanied by LEDs which show the charge level. Behind the rubber plug, there is the 3.5 mm auxiliary and the micro-USB charging port. Both speakers offer the IPX7 certificate. This means that they can remain functional after 30 minutes under about 1 meter of water. They don’t float unlike UE Megaboom or JBL Boombox. Boom 2 offers high-quality sound for its size and can fill up larger sized rooms at full volume. It is one of a few speakers that offer a full 360-degree sound. No matter which direction the speaker is facing, you will always receive the same loudness. Music sounds good indoors. If you want to use it outside you should probably consider UE Megaboom. After pushing the speaker over 90% of volume, a bit of sound distortion began to creep in, however, it’s not as bad as it used to be in the original Boom. UE has redesigned the drivers, which resulted in speaker is not only 25% louder, but also sounds better. JBL Pulse 3 sounds decent but not as good as you would expect from the speaker at this price level. Pulse 3 is not designed to offer the best sound for the price – remember that this speaker delivers a cool light show, which is not free. Similarly to Boom 2, it offers a 360-degree sound. You can place it pretty much anywhere in a room and expect to hear it well enough, as sound bounces off the walls. It will give everybody in the room the same listening experience. It produces crisp highs and good bass – just don’t expect the subwoofer-level bass experience. Both apps are available for free for iOS and Android devices. 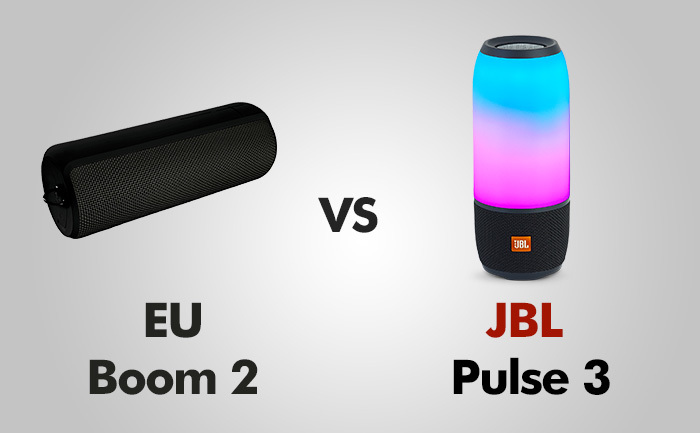 They are quite different, and the application created by UE offers much more than that from JBL. UE claims that the range of Boom 2 doubled compared to the original Boom. I was able to achieve more than 60 feet between the speaker and the phone before the connection crackled. If you have obstacles in the way you can get half of that. UE Boom 2 offers a great feature that is helpful for Android users – namely the NFC (Near field communication). With this feature, you can connect your phone to a speaker almost instantly. Contrary to Boom 2, Pulse 3 doesn’t offer NFC, but it allows to have two active connections at the same time – play the track from the second phone to immediately stop playing the current song. Ultimate Ears offers from 12 to 15 hours of play on a single charge (if you listen to it at 50% of volume). After the battery is depleted, you can charge it in 2.5 hours. In order to check how much battery life is left, squeeze the + and – buttons down at the same time and it will give you an audible battery readout. JBL offers a 6,000 mAh battery that lasts about 12 hours with the lights turned on – similar to Boom 2. Similarly to other JBL speakers, it has five LEDs (over the power button) that indicate how much battery is left. PROS: 360-degree sound / Water-proof / Durable / Very portable / Easy to connect / dedicated app / Can pair multiple speakers. PROS: 360-degree sound / Water-proof / dedicated app / Can pair multiple speakers. CONS: Weak bass / Average battery life / No dedicated buttons. CONS: Not very portable / Average sound for the price. Both speakers are good for different reasons. UE Boom 2 is for people who need to have a very portable, durable and waterproof speaker. JBL Pulse 3, on the other hand, is great for people who want to place it in a small to an average room. It looks great as a part furniture. They are not for somebody who wants the best possible sound experience. For this, you should look for bigger models.